Order - Begin an engagement involving your ship. 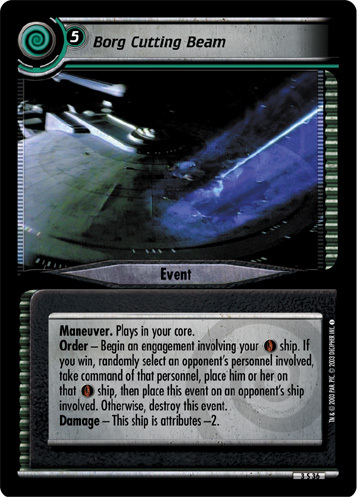 If you win, randomly select an opponent's personnel involved, take command of that personnel, place him or her on that ship, then place this event on an opponent's ship involved. Otherwise, destroy this event. Damage - This ship is attributes -2. Characteristics: engagement, take command (of opponent cards), manipulate opponent's attributes (ship), plays in your core, Damage, Maneuver. There are 13 entries for Borg Cutting Beam (ST2E 3 S 36) at the Tradeplace (50 haves and 2 wants). Click here to see all trade list entries for this Starter card!